Of course there's going to be a New New Beetle dressed up to look like Herbie, the car from Disney's 1968 classic film. It's too easy not to do. Draw on red and blue stripes, slap a number 53 on the hood and voila! New New Herbie. 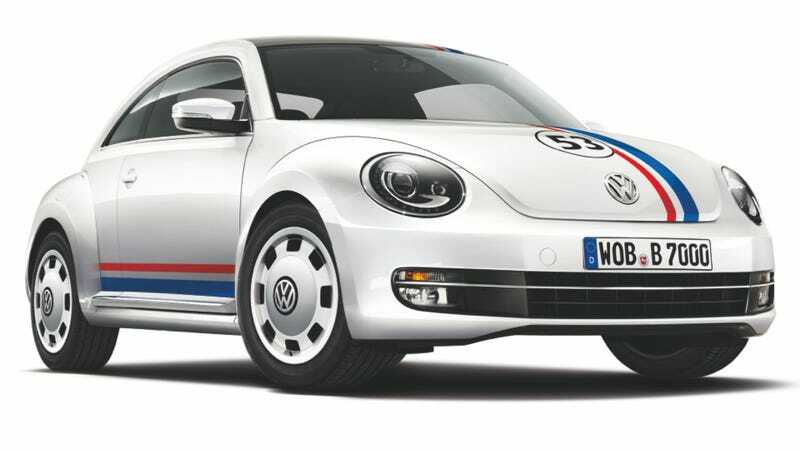 Unfortunately (or fortunately if you're most people), Spain will be the only country to get this 21st century Love Bug, dubbed the Beetle 53 Edition (y'know, for Herbie's race number). The rest of us were spared are left wringing our hands, wondering why other markets weren't blessed with this offering. Spanish buyers will be able to purchase the next gen Herbie with a range of powerplants: the 105 hp 1.2 TSI, the 105 hp 1.6 TDI, the 140 hp 2.0 TDI, and the 2.0 with a 6-speed transmission. Prices range from $28,000 to about $36,000, so the internet age Love Bug ain't exactly cheap. But other than the fact that a 2013 Beetle is nothing like the 1963 Type 1 Disney used in all of those cheesy Herbie movies back in the '60s and '70s, why hasn't Volkswagen put 53 badges on the doors? If you're going to make a tribute to a collection of ridiculous films, you might as well go all out.